Has the operator correctly fitted the clamp(s) and effectively grounded the bag? Has the bag lost some of it’s anti-static properties through damage or wear and tear? Is the operator using the correct FIBC type? Solution: Earth-Rite FIBC static monitoring system with control & alarm interlocks.The Earth-Rite FIBC system can check that Type C anti-static FIBCs have the correct static dissipative qualities and are correctly grounded/earthed. Bright red and green LEDs confirm the status of the bag ground connection to the operator. In addition, two relay contacts are provided to create a safety interlock via PLCs, etc., and to initiate an alarm in the event that the required conditions are not met.The control interlock will permit product transfer only when the resistance through the container grounding loop is less than 1×10^7Ωor 1×10^8Ω (depending on model). Alternative measuring ranges can be provided to special order, or to suit different types of container.The system utilizes a stainless steel monitoring clamp which should be attached to the conductive ground loop of the FIBC. This clamp is connected via a chemical and abrasion resistant Hytrel-coated spiral cable and forms the monitoring connection so that the resistance through the bag and down to ground can be measured. The static dissipation path is normally provided by the lifting hooks which should be bonded to ground. If not, we can provide a separate grounding clamp and cable for the purpose. 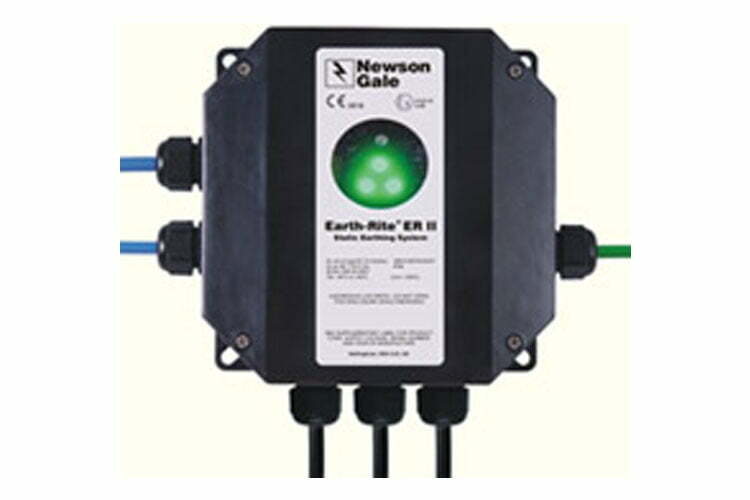 The monitoring system includes a separate junction box with insulated stowage pin for the sensing grounding clamp and cable. Ask Exloc about systems certified for Division 1 & Zone 1 areas. CSA (US & Canada) Approval Class I, Division 2, Groups A-D; Class II Div 2, Groups E,F,G; Class III, Div 2. Cable Hytrel coated spiral single conductor cable, fitted with in-line quick-connect. Monitored Resistance 1×10^7Ω or 1×10^8Ω (depending on model). Model FIBC8P1UA1A1 Earth-Rite FIBC 1×10^8Ω monitoring system + X45F stainless steel clamp + 16 feet / 5 m Hytrel cable + junction box with Quick Connect. Model FIBC7P1UA1A1 Earth-Rite FIBC 1×10^7Ω monitoring system + X45F stainless steel clamp + 16 feet / 5 m Hytrel cable + junction box with Quick Connect. Model FIBC8P1EA1A1 Earth-Rite FIBC 1×10^8Ω monitoring system + X45F stainless steel clamp + 16 feet / 5 m Hytrel cable + junction box with Quick Connect. Model FIBC7P1EA1A1 Earth-Rite FIBC 1×10^7Ω monitoring system + X45F stainless steel clamp + 16 feet / 5 m Hytrel cable + junction box with Quick Connect.